If you wish to create a grammar test online for free and share it with everybody, you can do it on Jotpub. It’s one of the features I built-in the website. Here is how to make a test, download it as PDF and share a link (to your students or other people interested). First, register here. I have simplified the process. It’s really necessary so you can have proper credits and edit the test, and for me to fight spammers and copyright breachers. 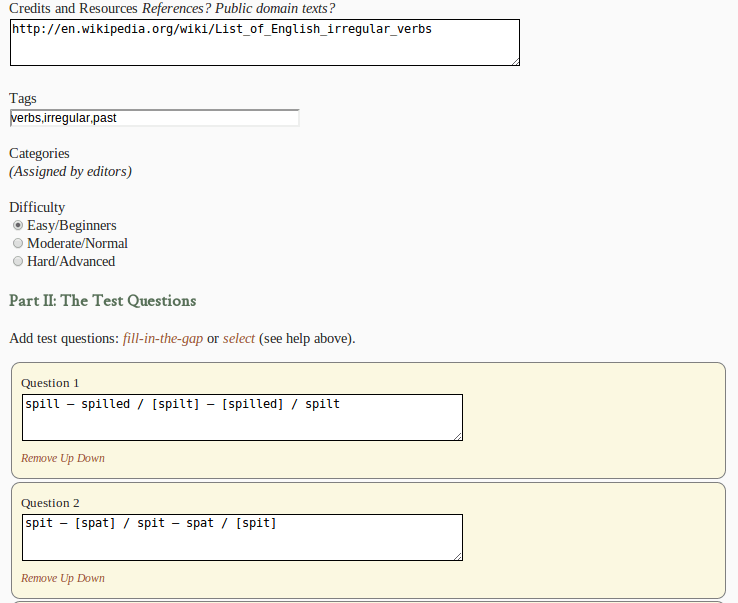 Then, go to Create page and fill in the info about the test. That includes Title, Description, Instructions, and Tags. These are all important, but I won’t go into details why. Categories is something I will add as an editor, because these items are predefined in the system. Finally, add some questions and answers! You can insert: Fill-in-the-blanks, True/False, Multiple with single correct and Multiple with several correct answers. The page is half-automated and I believe you will have no problems in figuring how to add and remove questions and answers. Here is a bit more help about the test creation. Of course, save your test! Once your grammar test is saved and created, test is yourself: you have to do this in order to verify that your answers match your questions (that there are no mistakes). If you notice an error, just edit the test. Do this by going to About and then clicking on Edit this test (only authors and editors can modify). After you solve the error-free test yourself, distribute it to other language learners. You can now share your little language exam with other people. Visitors do not have to be registered to solve the test or see the results. As for the PDF, guess what, every test has its PDF version created automatically! Just click on Get the PDF link on the top of the page, or search for the link at the bottom. Oh, did I mention already that this is all for free and without pesky ads?